Since the art league decided to do a show on graffiti art, I was motivated to think of something different. Writing on the walls became the theme of my thinking for awhile. I thought about why people write on the walls where others can see it. They have something to say? They just want to be seen? They like to vandalize? Graffiti has been recognized in museums all over the world. The Brooklyn Museum had an exhibit in 2006. Here are a couple of links. http://www.nytimes.com/2006/06/30/arts/design/30graf.html?fta=y and http://www.hhnlive.com/photos/more/12 . Enjoy. 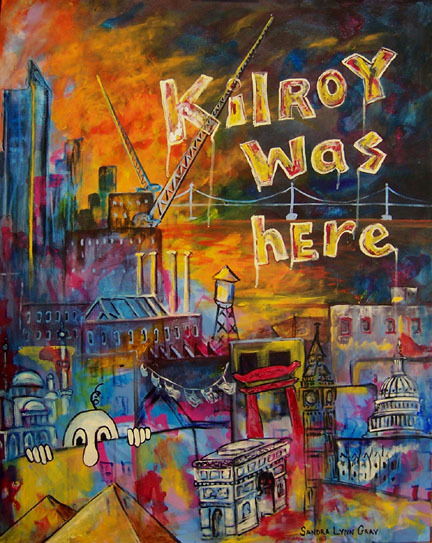 I chose Kilroy because I remember the Kilroy graffiti so well from my childhood. It typified graffiti to me. It started out saying simply that “an American soldier was here”. Then it became the joy of many a youngster. ~ by Sandra Lynn Gray on May 9, 2008. That is so Good! I love Kilroy but I’d almost forgotten. Your work captures such depth of emotion, and brilliance of life – something much deeper in each piece that I see. Thanks for sharing! I love the beautiful colors and the mix of real and make believe! This is simply amazing. I stumbled over here from Ellen’s blog. I mean, I’d pay a pretty penny for this painting. Awesome – thanks for sharing it. You know, there are times when my hands would itch and would dare to write on public walls but never did. Honestly, some graffitis I’ve seen on highways here were really good. It seem to add color in those boring cement walls constructed to separate the highway from the nearby neigborhood (and reduce noise as well). On May 24-25 is Art tour in Maastricht,Netherlands. I can’t wait! It’s going to be my first time to witness an event such as this. I read that there’s an area to do your own graffitis. ohlala. Oh how I remember Kilroy. My kids don’t have a clue about that long forgotten character. I see Kilroy and think of World War II. Kelroy was a needed character during those rough years. He was ‘comic relief’…. Your picture is perfect in every way and it brings back many memories. Thanks for showing this. I’m really impressed with your writing skills and also with the layout on your blog. Is this a paid theme or did you modify it yourself? Anyway keep up the nice quality writing, it’s rare to see a great blog like this one today. The clarity in your post is simply nice and i can assume you’re an expert on this subject. Well with your permission let me to grab your feed to keep updated with forthcoming post. Thanks a million and please carry on the enjoyable work.